We love soup here at our house and I'm always on the look out for new soup recipes. Especially now that the cooler weather has finally arrived! For the next several weeks, I invite you to join me for Soup's On! 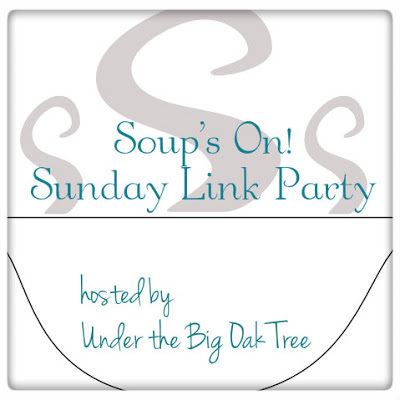 Sunday where you can link up your best soup recipes (recipes for stews and chilis are welcome as well!)! *Soup's On! Sunday Link Party will begin every Sunday at 12:01am and will close on Wednesday evenings. Link to your recipe post and not your home page. It just makes it easier to find your recipe! Provide a link back to this Soup's On! Sunday post somewhere within your post. Leave a comment on this post after linking up. Let me know what you shared this week or simply say "hello"! Check out some of the other recipes shared here this week! Congratulations on your new party and I am so excited to be first. I am sharing my Hamburger Casserole Soup for the party today. Hope you have a special day and thanks for hosting! Thanks for the party. I am sharing my Cheesy Lasagna Soup. Cooking tonight and warming up Election night. No cooking that night for me. Congrats on your party! I will need to link up something great next week! Now I know where to come to get delicious soup ideas. Wish I had one to post but hubby only likes to eat soups when he is sick. Oh, I'll be back for ideas! I love soup any day but especially on a lazy Sunday! Yum I love making soup but I'm not very good at it yet! Wordless Wednesday ~ Fall Fun!